I wouldn't be surprised if you've somehow missed the Earth Defense Force games. They've been stomping around in the background since 2003, when D3 Publisher set out to make a series of budget-minded PlayStation 2 games. Developer Sandlot offered up a straight shooter, pitting humanity against wave-upon-wave of giant bugs. Since then, Sandlot has made a total of seven entries and the franchise has become something of a cult favorite. Sandlot has played around with the formula before, but stuck with a common core. The exceptions are the games not developer by Sandlot: Earth Defense Force Tactics from ThinkArts and Earth Defense Force: Insect Armageddon by Vicious Cycle Software. 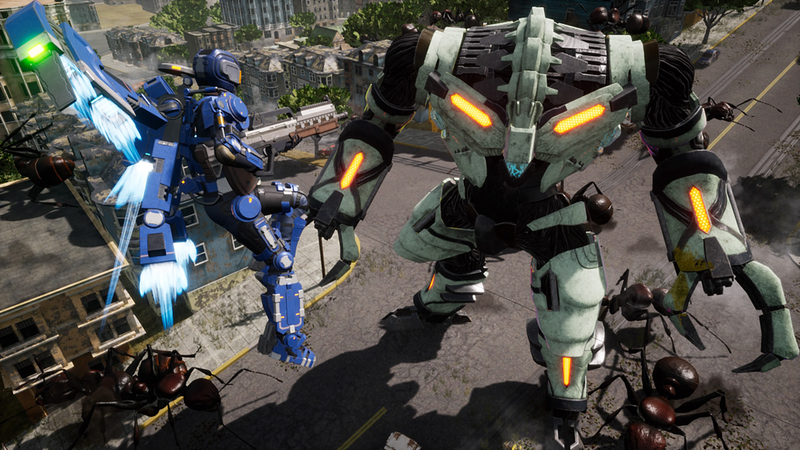 The latest entry in the franchise, Earth Defense Force: Iron Rain, is similar to Insect Armageddon, in that it's aimed towards a Western audience. Instead of handing the series over to a Western studio, D3 Publisher has instead put Iron Rain in the hands of Yuke's, the developer behind the WWE 2K series. It's a Western focus from a Japanese developer. It's a good concept, but it doesn't quite land. The plot, thin though it may be, involves yourself as the lone survivor of a previous attack from the alien Aggressors. You were the hero of the day, taking down the Hivecraft, only to get caught in the wreckage. The damage put you into a coma for seven years, and upon waking up, you're thrown back out into the field in a mobile Blast unit. (You'd think maybe they'd let you relax, but at least you should be glad they didn't put a vegetable into combat.) The squad refers to you as only The Closer, a heroic ur-soldier they laud and speak of in hushed tones. 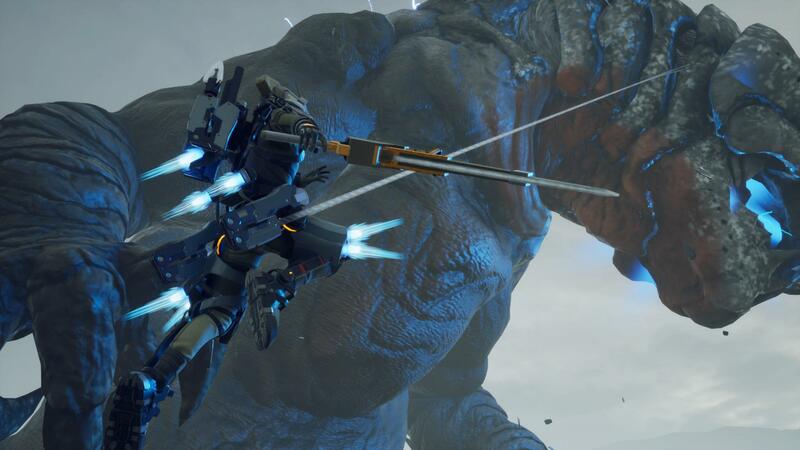 On a moment-to-moment basis, this is the Earth Defense Force fans have come to love, with your characters blowing away hordes of giant insects, aliens, and robots. There's no other real method of engagement here, because that's not what EDF is all about. Shoot, shoot some more, and make sure to grab your loot before the mission is over. The Western focus comes with new locales based overwhelmingly on California: expect the steep streets of San Francisco alongside deserts and cliffside beaches. Iron Rain even stretches itself, taking you to the sand-covered remains of Las Vegas. Iron Rain rethinks some classic mechanics in the EDF franchise too. First and foremost, there are no hard classes. You still have four different types of PA Gear exoskeletons, which offer different overall stats and special abilities. The Trooper is your basic soldier, with average speed and a dodge move. Jet Lifter is the new name for the Wing Diver class from previous EDF titles, with the ability to fly through the air at the expense of having low armor. Heavy Striker is slower than the rest, but it can use two weapons at once, and protect itself from damage with a barrier. Iron Rain's totally unique class is the Prowl Rider, which can use a grappling hook to get around the battlefield and take control of some creatures you'll come across. (It's clear the Prowl Rider is a homage to the omni-directional mobility gear of Attack of Titan.) The Prowl Rider is a ton of fun, and if there isn't an Iron Rain sequel, I hope something similar comes to the mainline EDF games. The other classes are pretty straightforward, forcing you to choose between speed, armor, and offensive capability. And there's a little resource management for each class, as the Trooper gets five charges of dodge, compared to the Jet Lifter having to use their jets sparingly to prevent overheating. Unlike previous games, every class can use every weapon in the game. Assault Rifles, Shotguns, Missile Launchers, Sniper Rifles; it's all open. You no longer find weapons mid-mission either. Instead, they're rewarded post-mission and you can unlock them for use with credits and a specific number of red, blue, and yellow energy cores you'll find on the battlefield. Not only does the core of the system provide a lot of flexibility, there's also a huge amount of weapon variety. Outside of the weapon types, each weapon has its own damage, reload speed, and range values. Some have unique perks, like an assault rifle with a lucky bullet that does a ton more damage. You can set a loadout prior to each mission, and you'll settle into a groove after a while, with only slight shifts in your preferred gear from mission to mission. My major issue is in the mid-to-late game, the weapons cost a lot to unlock, but you have no way of testing a weapon before you spend the resources on it. That means you can spend a lot to unlock a weapon, only to realize after the fact that you don't like it. Unfortunately, many of the weapons feel like they lack impact. It's partially a result of the sound design for some of the earlier weapons like the assault rifles, shotguns, and rocket launchers. There needs to be a little more BOOM to these weapons. Earth Defense Force: Iron Rain was marketed as a push towards a more serious tone for the series, and while I found that the B-grade sci-fi tone is still apparent, the graphics at least try for a more realistic, subtle feeling. The maps look a little better for it, but once all the buildings crumble around you from the overwhelming firepower, it still has that flat, simple look of previous games. The bright side of the smaller number of maps is that each one feels markedly different, so you're not entirely facing the same encounters from map-to-map. On a PlayStation 4 Pro, it performs fine, though the frame rate does still break during heavy action. There's also a whole host of under-the-hood changes that switch up the overall feel of Iron Rain compared to its predecessors. Combat overall feels a bit stiffer compared to the looser Sandlot games. The hordes are also smaller, with Iron Rain focusing more on large scale encounters. Unlike EDF5, it's not throwing huge amounts of enemies in your direction, thus making each individual enemy a bit more meaningful, and thus more dangerous. In fact, the ramp up in difficulty and monster size is much quicker in Iron Rain; I assume this is because of the smaller number of overall maps compared to previous EDFs. Combining both means you'll hit a spot around the midpoint where you'll sometimes die real quick if you're not paying attention, and a lack of checkpoints means you're starting from the beginning again. It's also missing a crucial visual indicator of enemy damage on some of the mechanical enemies. While you do know when they're almost dead, due to a red glow on certain parts, it still feels like there should be a few more gradations to terms of visual damage indication. If we're working with fewer enemies, then I need to quickly know exactly how much damage each enemy has taken, so I know where to focus fire. Given the focus on Western players, there's more online play to be found in this iteration of Earth Defense Force. There's cooperative play, which was in Earth Defense Force 4.1 and Earth Defense Force 5, offering online co-op and two-player couch co-op. There's also a competitive PVP mode, which pits two teams of four players again one another in an arena with AI enemies. You collect the same gems from the PVE campaign and dump them at specific spots on the battlefield. Killing other players is more about denial of resources than the actual focus of play. PVP certainly isn't the strongest part of Iron Rain, more of a value-add than a reason to pick up the game. I find myself a little ambivalent on some of the changes made for Iron Rain. It's still Earth Defense Force, so I found myself enjoying my time, but a few of the design decisions needed some more polish. Opening up the weapons to every class is great, but I actually found myself preferring collecting weapons in-mission. The encounter and mission variety here is better than some previous EDFs, but I miss some of the larger swarms of those games. Iron Rain is always taking one step ahead of the older EDF games, but one step back at the same time. In the same, it's the same in terms of overall execution, but different in its focus. Hopefully, a sequel to Iron Rain will smooth over some of the problems of this first outing, or at least some of the better changes will find their way back to EDF proper. Tagged with D3 Publisher,	Reviews,	Yuke's.